Saratoga Springs Resort & Spa. Photo by Sue Holland. On May 17, 2004, Disney's newest Disney Vacation Club (DVC) resort opened to the public. 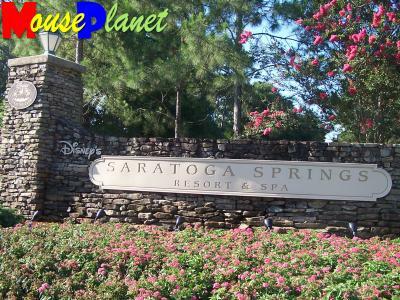 Located on the grounds of the former Disney Institute, Disney's Saratoga Springs Resort & Spa will eventually become the largest DVC resort when construction is completed in 2006. Phase I, the first set of four buildings, was built directly across from Downtown Disney, with one building open in May and the remaining three coming online in the subsequent three months. The public spaces are open, and are delightfully uncrowded since there are so few guest rooms being rented in these early stages. This is a great time to try this new resort, particularly for anyone who is not a member of DVC. Once the resort sells outphase I was 75 percent sold before it even openedmost of the availability will go to DVC members. Every Disney resort has a theme, and at Disney's Saratoga Springs Resort & Spa the theme is Health, History and Horses. Examples of this theme are abundant throughout the resort. The resort is home to a very extensive spa and fitness center, which satisfied the health. Photographs and furnishings incorporate horses in all areas and there is a display of memorabilia depicting the real Saratoga Springs' horseracing history. This article focuses on the accommodations available here, while the next installment covers the public areas. As is typical for DVC resorts, accommodations come in four sizesstudio, one-bedroom villa, two-bedroom villa and three-bedroom grand villa. A two-bedroom villa is simply a one-bedroom villa and a studio for the second bedroom. The 2004 room prices range as follows, with the low rate representing value season and the high rate in effective from December 20 to 31, 2004. Room prices do not vary by location, but do change with the season. Tax is an additional 11 percent per room per night. One side of the studio has the bed and sleep sofa. Photo by Sue Holland. 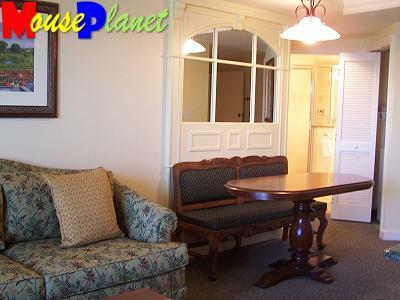 The studio accommodations are ideal for a couple or a family traveling without children, or for someone traveling solo. 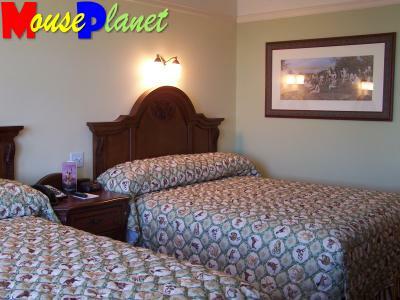 Each studio has a queen-size bed and a full-size sleep sofa, along with a small table and two chairs. 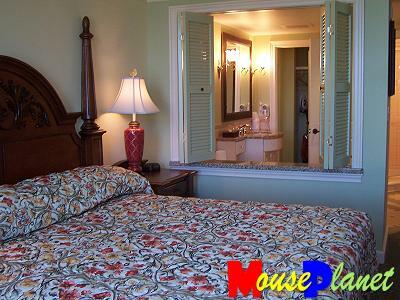 There are several drawers in the armoire, which is an improvement over earlier DVC resorts such as the Boardwalk. While families might prefer two regular beds, having the sleep sofa makes the studio feel more spacious and provides a comfortable place to sit and watch TV or visit with friends. It appears more like an efficiency apartment than a bedroom. The other side of the studio has the table, chairs and armoire. Photo by Sue Holland. 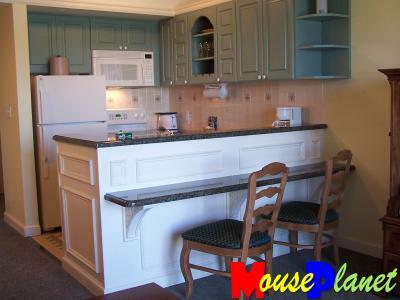 One very nice feature of all DVC studios is the addition of a mini-kitchen area. While it would not be sufficient for cooking elaborate meals, it is perfect for a quick breakfast or reheating leftovers for a later snack. 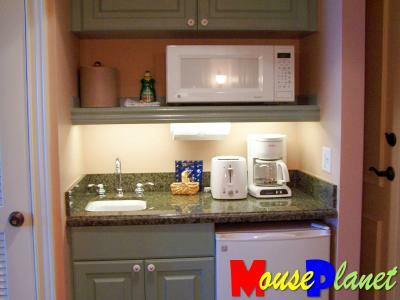 There is a sink, half-size refrigerator with small freezer, large coffeemaker, toaster and microwave. Four ceramic coffee mugs and drinking glasses are included, along with plastic utensils and paper plates/bowls. Dishwashing detergent is provided, as well as the initial package of coffee. The studio mini-kitchen is well equipped. Photo by Sue Holland. 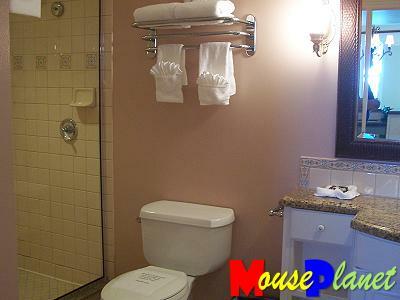 The bathroom is the same as in any of the deluxe resort rooms. A large vanity sink area is located outside the actual bathroom, between the bathroom and the closet. In the actual bathroom there is a toilet and a bathtub/shower. This area is a decent size, and having the sink outside but not visible from the bedroom area is a nice feature. Studios sleep up to four people, plus one baby under 2 years of age who would sleep in the porta-crib found in the closet. A comfortable living room awaits in the one and two-bedroom villas. Photo by Sue Holland. 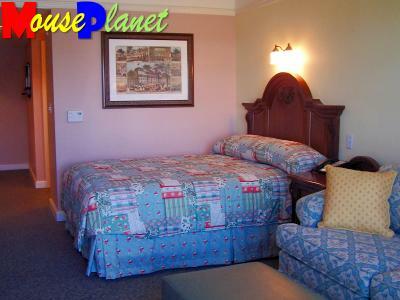 For accommodations that are certain to impress, the next level at any DVC resort is the one-bedroom villa. These come with all the comforts of home, and then some! Although none of the DVC resort villas equal the original (Old Key West) in villa size, the Saratoga Springs units are still a great choice. The furnishings are high quality and attractive, and the villas provide significantly more space than a traditional resort room or studio. The living room includes an attractive sleep sofa, and the dining table is an elongated table with a bench seat on one side and two chairs that can be pulled over from the breakfast bar. 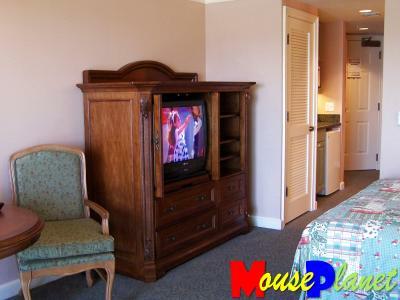 The television even includes a dvd player, with rentals available at the resort. Both one- and two-bedroom villas have full kitchens. Photo by Sue Holland. The kitchen is especially nice. Not only is it completely outfitted with just about anything you could possibly need on vacation, it is an attractive focal point of the unit. 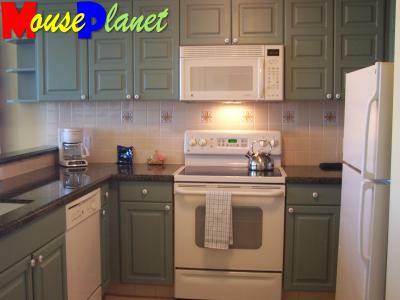 The refrigerator, stove/oven and dishwasher are full-size units. There is also a microwave, coffee maker, china and glassware for eight people, and a full set of pots and pans. There should even be a blender in the cabinet, good for making a batch of frozen cocktails in the villa! The stove is the glass-top version rather than one with old-fashioned burners. Master bedroom in a one- or two-bedroom villa is a luxurious retreat. The master bedroom is large and very comfortable. A king-size bed is the main feature of the room, along with plenty of drawer space for two people. A nightstand is on either side of the bed, and there is a storage chest located next to the armoire. These villas have a large porch, which can be accessed from either the living room or master bedroom, and the porch has a large round table with four chairs. There is a large open window with louvered doors connecting the bedroom with the bathroom, but no door separating the entire area. The master bathroom is a multiroom suite. Photo by Sue Holland. 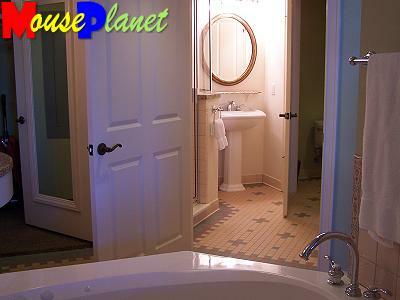 Coming from the bedroom, the first section of the bathroom contains a large whirlpool tub. While sitting in the tub, the window to the bedroom can be opened or closed depending on whether conversation with someone in the bedroom is desired. A pedestal sink and closet round out this particular room. Continuing on, there is a large shower stall and another pedestal sink behind in a room with a separate door, and beyond that behind another door is a small room containing the toilet. The washer and dryer are the stack version and are located just beyond the bathroom, coming back toward the hallway to the kitchen and dining area. These bathrooms are unlike any found in the non-DVC resorts, and although the sheer number of doors can be confusing, having all this space and the whirlpool tub is one of the best things about staying in a villa. The one-bedroom villas sleep up to four people, while the two-bedroom villas sleep up to eight people. One additional baby sleeping in a porta-crib is also permitted. The grand villa living room. Photo by Sue Holland. For people with large parties or who simply want the top-of-the-line in their lodging, a grand villa might fit the bill. These large and luxurious units have three bedrooms and four full bathrooms, and may even be nicer than your real home! The grand villas sleep up to 12 people, but having that many people will definitely feel a bit cramped unless half of them are children. The living room is a comfortable and attractive gathering place, with lots of natural light thanks to a large window that stretches almost two stories in height. There is a sleep sofa in the living room, to accommodate two of the 12 allowable guests. The fourth bathroom in the grand villa. Photo by Sue Holland. Whoever gets assigned the sleep sofa will not have to share a bathroom there is a full fourth bathroom next to the living room. It consists of a shower stall, toilet and vanity sink. The large television in the living room comes with a dvd player, and the room is open to the second story where the two guest bedrooms are located. The hallway upstairs overlooks the living room and large window, offering a very nice view. The grand villa has a separate dining room. Photo by Sue Holland. The grand villa dining room is separated from the living room by a wall, but is open to the kitchen. There is a leaf for the table which when installed provides seating around the table for all 12 people. The wood is dark and rich looking, as found throughout all of the villas at this resort. Spacious kitchen in the grand villa. Photo by Sue Holland. 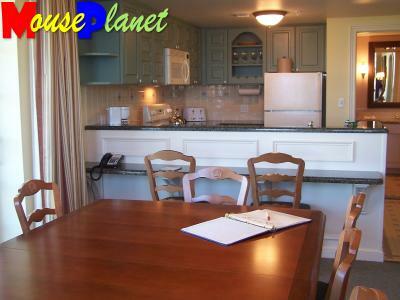 As with all DVC units, and grand villas in particular, the kitchen is large and well appointed. Appliances are full size and modern, and just about anything needed to prepare a meal can be found in one of the drawers or cabinets. Master bedroom in the grand villa. Photo by Sue Holland. The master bedroom is truly a retreat! It is open to the master bathroom just like the smaller villas, but the layout is slightly different. 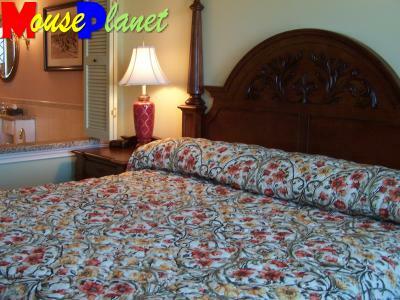 The bedroom has a large king-size bed, plenty of drawer space, and access to the porch. 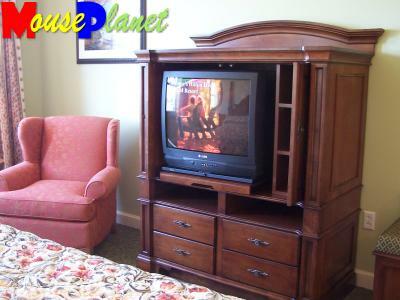 The television is larger, at 27 inches and there are seating areas in the bedroom. However, the bed is clearly the largest piece of furniture and takes up most of the room. Master bathroom in the grand villa. Photo by Sue Holland. The bathroom has the Jacuzzi tub by the window that's open to the bedroom, as well as a separate shower stall in another section of the bathroom suite. The bathroom is also beautifully decorated and is quite spacious for two people. One of the upstairs bedrooms in the grand villa. Photo by Sue Holland. Upstairs are the second and third bedrooms, each of which has a private bathroom. These bedrooms contain two queen-size beds, an armoire with television and adequate drawer space and a small table with a couple of chairs. 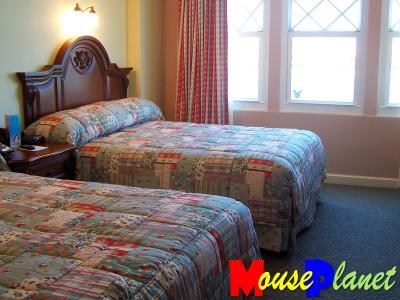 Each bedroom compares favorably with a regular room in any deluxe Disney resort, and would be quite adequate for a family of four. The other upstairs bedroom in the grand villa. Photo by Sue Holland. 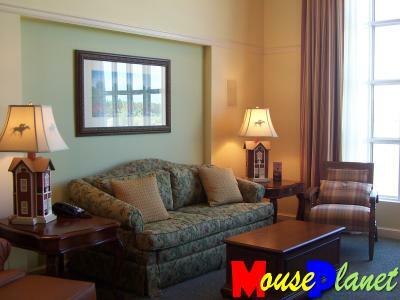 Overall, the accommodations at Saratoga Springs are attractive, spacious and very comfortable. DVC has top quality resorts, and Saratoga Springs is a great addition to the collection. The next article will feature the rest of the resort, so come back on August 13!